The orDrumbox is a free drum machine software, designed to be as creative as possible with some unusual features : auto-composition, polyrythmes, custom arpeggiator, automatic sounds/track matching , custom softsynths, lowfi rendering and more ... Ideal for experimentation and fast results. This software can automatically compose bass line, melodic patterns and complete songs. It comes with rythms database and sounds database including music items which can be fully edited. 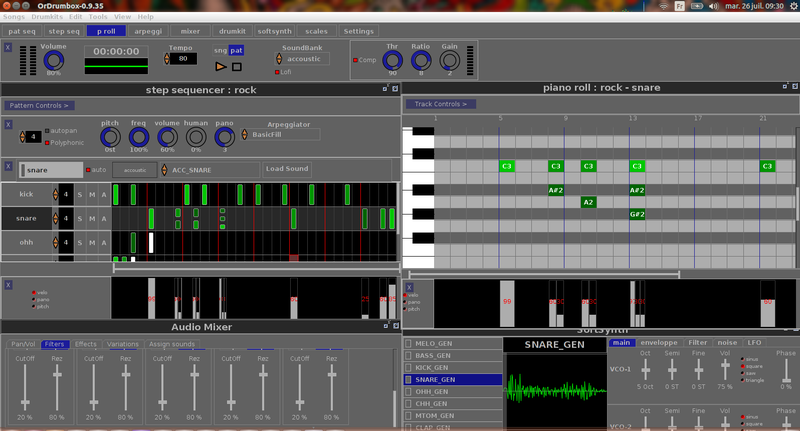 And a fully customizable softsynth section add many synthetics sounds as presets to sounds library. Download free latest version. Ready for desktop installation. The license for the packages is GPL2.